My kids don’t read my posts, which gives me a certain freedom to write about the parental white lies in which I engage. When we lived in Cambridge, England, last year, the nights that we had homemade burritos were few and far between because I just couldn’t find the ingredients in the grocery stories. Here in the US, with the substantial Hispanic and Chicano population, it’s not a problem. When I make burritos, my kids rebel against the vegetarian version of refried beans. They like the “traditional” version with lard. As a vegetarian, I abhor the lard, but I have always bought both the traditional and the vegetarian because the kids say they can tell the difference. When they were younger and not as polite as they are now (ha!) they used to make loud gagging noises and spit out the vegetarian refried beans if they accidentally made their way into the burritos. Needless to say, I always bought both types to satisfy all palates. One day about five years ago I found that I had only vegetarian refried beans in the house, and I was not about to run out to the store to get a can of traditional refried beans. So I faked it. 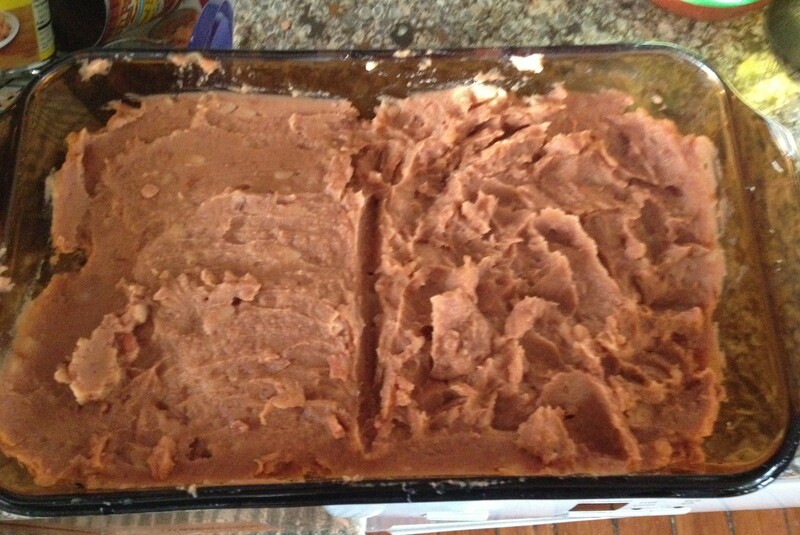 I put two cans of the veggie refried beans in a casserole dish, drew a line down the middle, then smoothed out one side and “fluffed up” the other. Then, when the kids wanted to know which was the “good stuff”–meaning the lard-ridden beans–I pointed to the fluffed-up side. The kids didn’t know the difference and happily chowed down. And now that’s what I do every time we have burritos. We had burritos last night, and after John, my 16-year-old, asked which side had the “good stuff,” he snarfed up a large spoonful of it. I asked him if I could take a photo, which I did. 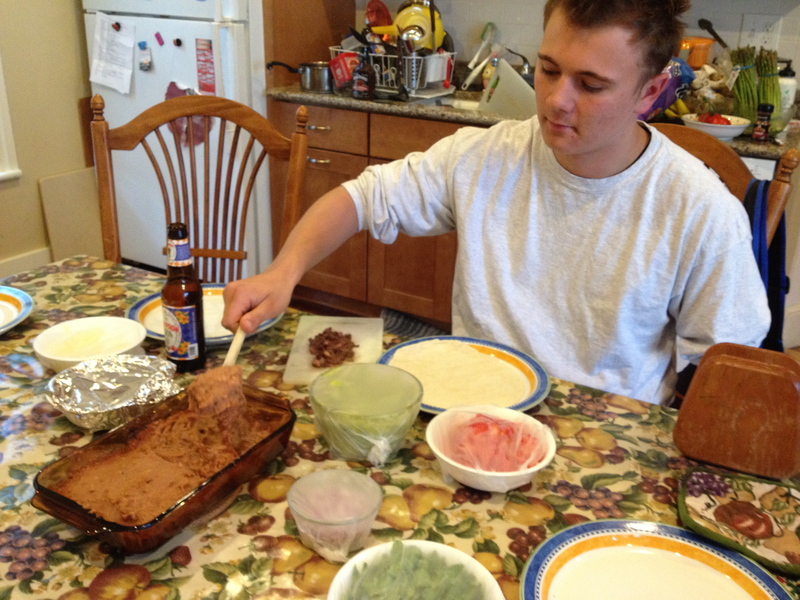 John scooping up veggie refried beans for his burrito. And because they don’t read my posts, John and his older and younger sisters will never know that they have been happily eating vegetarian burritos for the past five years! Are there any white lies you tell your kids to just be able to get through the day (and keep your kids healthier)? I was veggie for 19 years and often fed my dad food with no meat in. He would only ever comment if he was told it was vegetarian. Eh oop, eeh bah Mum! Tha musna doo that t’faither, lassie! Ah, clever parents! I haven’t heard that one before . . .